My morning routine begins with a glass of orange juice followed by breakfast at the table while doing my devotions, An omelette with waffles or homemade cinnamon rolls sounds very nice. After that, I'll go for a walk around the park just around the corner. By this point, it's nearly 12 pm and I've prepared to meet the day. I like to read a couple of news sites early in my work day. Because it's a perfect day, however, I won't go to work. Instead, I'll do a little writing, a little blogging and a little bit of miscellaneous work on whatever project I find interesting or useful that particular day. Two or three hours of solid concentration should help me make good progress. 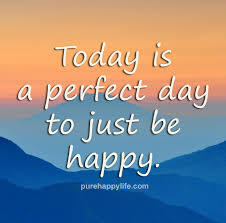 On a truly perfect day, I would accomplish what I want and need to accomplish. I would feel no external obligations beyond those which I actively sought out for myself for that day. I would spend time with the people I care about and not distract myself while they talk to me — I'd have real conversations with them, when we look each other in the eyes and really think about what the other people are saying. This my friend was a perfectly written post! Heaven is what I'm waiting for too! Hmmm. I think we can take some elements of "our perfect day" and see what dreams are dormant in our hearts. Like wanting to spend more time with family, or writing a bit more, or take care of ourselves a little better. 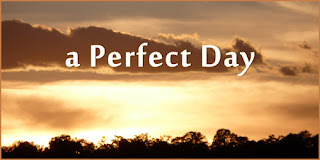 But the truth is the only perfect day is in heaven. We need to embrace perfect moments on this side of it!